The Northern Beaches Cluster had the first meeting for their cluster project, ‘Sustainable School Communities Project’. The meeting was hosted by St Mary’s, Manly, who are leading the way with their sustainability initiatives. 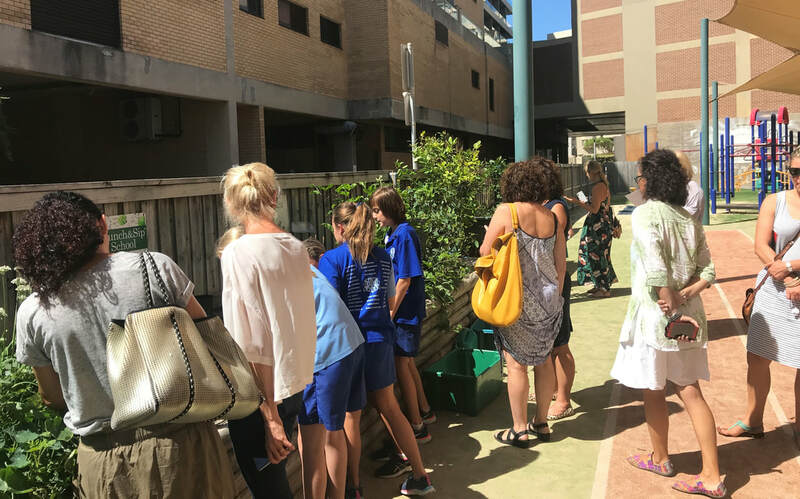 There were parents who attended from St Mary’s Manly, St Cecilia’s Balgowlah, St John the Baptist Freshwater, St Rose Collaroy, St Kevin’s Dee Why and Sacred Heart Mona Vale. All parents were very excited about working on a project together to live a little more sustainably, reduce their footprint, and have some fun with other parents and school kids. Carmel Hewitt, Educational Officer - Parent Liaison, welcomed the parents and explained how the project came about last year at the Northern Beaches Cluster Meeting when CSP Reps were discussing what their schools are doing to be more environmentally friendly. It was apparent that many schools have some projects already in place and all reps were keen to see what else they could do. 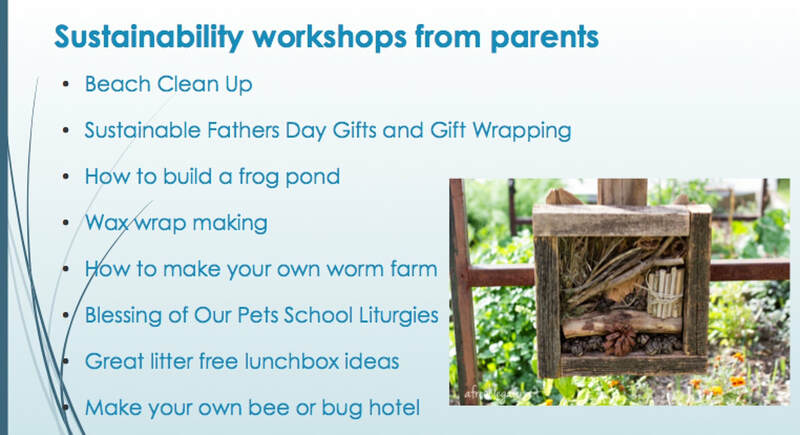 The purpose of the project is for parents to identify what they can do to support schools in their environmental pursuits. The objective of this meeting was to hear from newly appointed Education Officer – Sustainability, Catherine Judd, about initiatives parents could consider, to hear what St Mary’s Manly is already doing and to discuss how parents would like to move forward with the project. Carmel mentioned that the Season of Creation, a time for Christians to celebrate creation is being held from the 1st September until 4th October and we could work towards this date to create some events over this time. Carmel Hewitt then introduced Catherine Judd to the group. Catherine is the newly appointed Education Officer – Sustainability at Broken Bay Catholic Schools Office. Catherine spoke about Pope Francis’ last encyclical published in May 2015, ‘Laudato Si' – Praise be to you, On care of our common home’. It was a call out to all people to care for our common earth in line with our Catholic Values. The UN Sustainable Development Goals were set in 2015. The 2030 Agenda for Sustainable Development, adopted by all United Nations Member States in 2015, provides a shared blueprint for peace and prosperity for people and the planet, now and into the future. At its heart are the 17 Sustainable Development Goals (SDGs), which are an urgent call for action by all countries - developed and developing - in a global partnership. They recognize that ending poverty and other deprivations must go hand-in-hand with strategies that improve health and education, reduce inequality, and spur economic growth – all while tackling climate change and working to preserve our oceans and forests. ​The Vatican is hosting a conference this week around how we, as Catholics, are going to support these development goals. 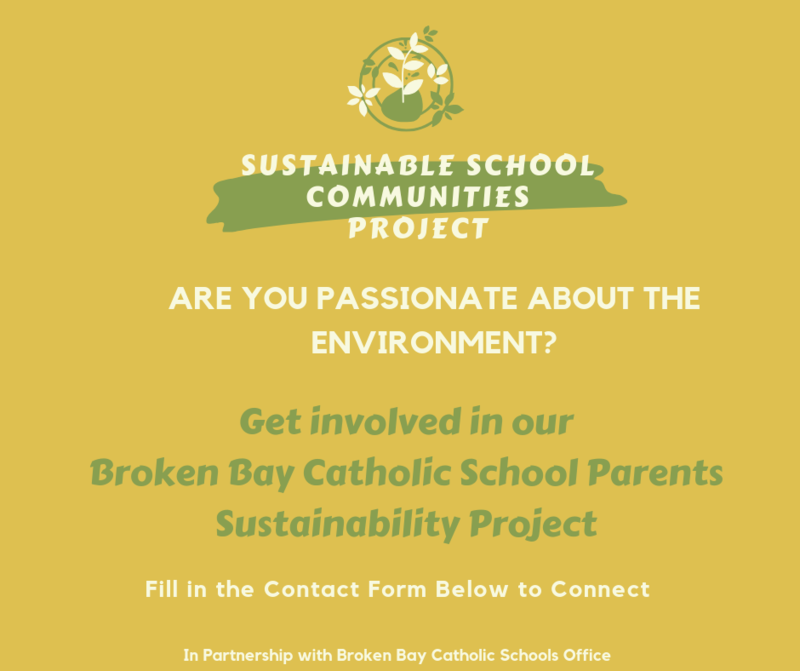 Catherine Judd has also spoken to Peter Hamill, Director of CSO about how Broken Bay Catholic Schools can work towards supporting these UN Sustainable Development Goals. · explore and investigate their world. · propose actions needed to maintain and improve their environment. · take action for a more sustainable future. St Mary’s were our hosts for the meeting. We asked them to host because they are leading the way in sustainability initiatives. 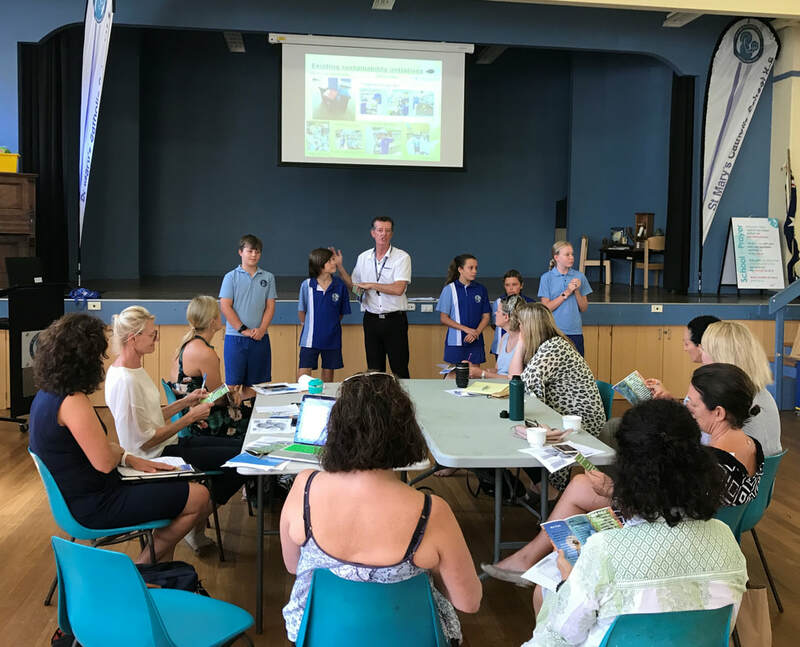 Vital to their success is their environmental champions, Principal, Paul McGuire, Year 3 Teacher, Claire Sheppard, many parents, the Year 6 Environment Leadership Team and the Manly/Freshwater Parish environment group, Eco Operate. All parties work closely together for their common passion, the environment. Principal, Paul McGuire explained to the group how their passion for the environment came about. Laudato Si’ provided the moral reason for St Mary’s mission and then the environmental committee provided a strong structure with which to work. Paul said that is very important to have eco champions as teachers, parents, students and parishioners working closely together to achieve the common mission. St Mary’s Year 6 Environment Leadership Team spoke with conviction about their important role as environmental stewards for their school and community. Their main focus is to educate the smaller children about looking after our environment. They teach them about waste, which bins to put the correct rubbish in, help them in the school garden, looking after the compost and worm farm and keeping an eye on the stingless native bees. They are responsible for promoting ‘Waste Free Wednesday’ and ‘Plastic Free July’ as well as working with local community groups. Claire Sheppard, their teacher champion, talked about St Mary’s Laudato Si’ Litterati Crew App, which logs litter picked up around the community, and invited other schools to join their mission. The talk by the St Mary’s team ended with a tour of their impressive environmental initiatives. Attendees were inspired to take some ideas back to their parent community. Parents were inspired by the ideas Catherine Judd put forward and St Mary’s initiatives and are keen to work on a project together and with their schools. Parents will need to liaise with their P&F teams and schools to identify interest and ways forward for their individual schools. A structure of how to proceed and work with schools, families, community, parishes and the BBCSP would help ensure a successful project. It was agreed for this to be successful in schools there would need to be a group of environmental champions, i.e teacher, parents, students, parishioners to form an environment committee. What are schools already doing? Parents agreed waste should be an initial focus. How do we reduce waste and improve our recycling at home and school? Catherine Judd suggested a good place to start and get kids excited is a school garden, with a compost bin and worm farm. 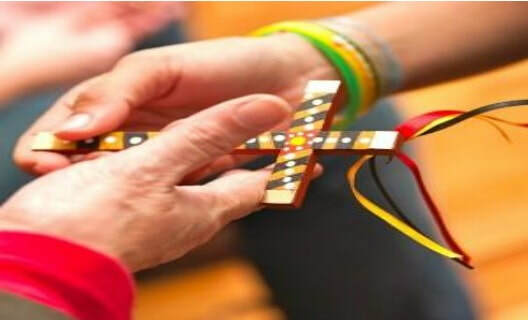 It became apparent at the Term 3, 2018 Northern Beaches Cluster meeting that our Catholic Schools on the Northern Beaches are very passionate about our environment and sustainability in our schools. 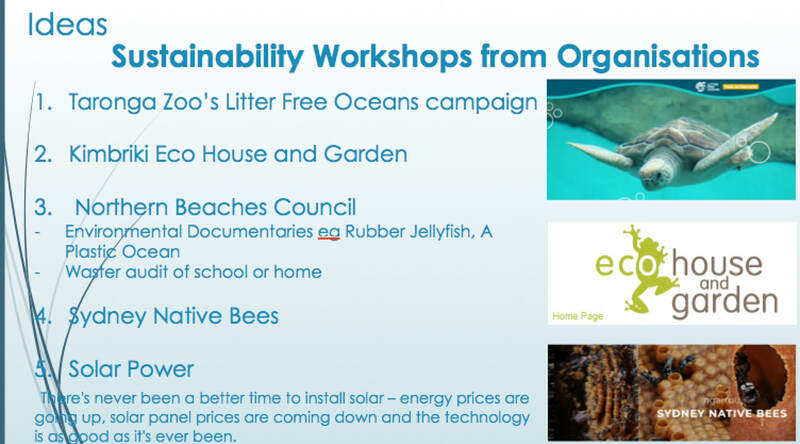 There are some great environmental initiatives already happening in our schools and CSP reps decided sustainability should be our general focus for 2019. Above: St Mary's Principal, Paul McGuire and Year 6 Environment Leadership Team talk to parents about their initiatives. Above: St Mary's students show parents their school garden they have been working hard on. All registered schools in NSW are eligible to apply. Projects working primarily with students with special needs are encouraged. Little Penguins: The little penguin is the only penguin species that breeds on the Australian mainland. Currently, the only known mainland breeding colony in NSW is in a secluded cove in the Manly area of Sydney Harbour. This colony has been declared an endangered population. We acknowledge the traditional custodians of this land, who long before us lived, loved, explored, protected the land and raised their children.